Never again will I underestimate public transportation. It has saved me from being late to class on numerous occasions and from the dreaded shin splints. 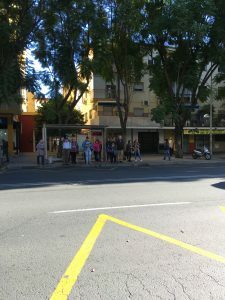 Normally, it takes 30 minutes to walk from my homestay to the University of Sevilla and 45 minutes to walk to the CIEE study center. In total, that is 1 hour of traveling there and back from the University and 1.5 hours there and back from CIEE. Monday thru Thursday I have 2 classes every day separated by a lunch break where I return to my homestay. So, the total daily walking time adds up to about 3 hours just for classes. The views on the walk are great but, I feel that I am losing precious time during the day and my legs hate me. Consequently, I decided to change my routine a little. There is a bus stop conveniently located just down the street from where I live, so I started alternating between the bus and walking to class. The bus is very efficient, usually cuts the walking time in half, and only costs 75 cents. It’s also a great way to improve my Spanish listening skills. There is even a designated airport bus, which I take advantage of for my weekend traveling. 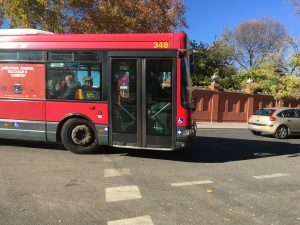 I have dabbled in other modes of public transportation like the metro and the tram, but the bus is by far my preferred method. 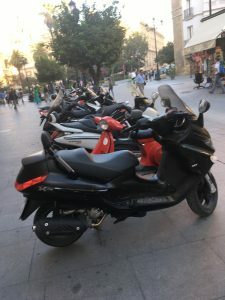 My mom will be happy to know I have not tested out the bikes or motorcycles, which seem to be popular amongst the sevillanos. 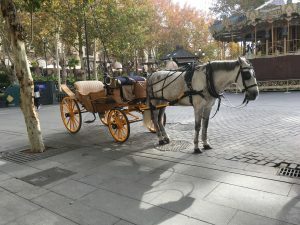 With tourists, the horse-pulled carriages are a hit. 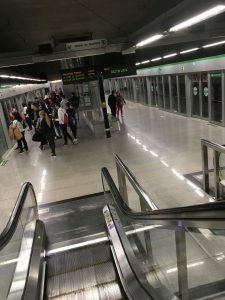 Before coming to Spain I had never taken public transportation nor did I consider needing it. At Hope, everything is located within walking distance of each other: the academic buildings, the gym, the cafeteria, the residence halls, and the student center. Plus, there’s a weekly Meijer shuttle for those who aren’t on a meal plan. As for the city of Holland, there are a few lines of Max buses, but that’s the extent of its public transportation. I have my own car so I have the freedom to drive wherever, whenever. In Sevilla, this is not the case. I had to learn the bus numbers, routes, and times. This put my millennial map reading skills to the test. Of course, after taking the wrong numbered bus a handful of times, I discovered the google maps app which displays public transportation routes. However, getting lost was worth it because I got to see parts of the city I normally wouldn’t see. Once I became comfortable with the main streets, I purposefully took new routes and walked the narrow, winding, colorful roads. 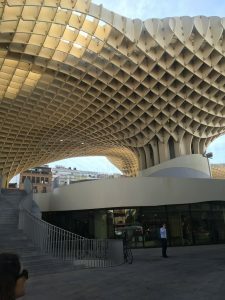 I have stumbled across unique stores, coffee shops, and even Las Setas (an incredible wooden structure resembling a giant mushroom). 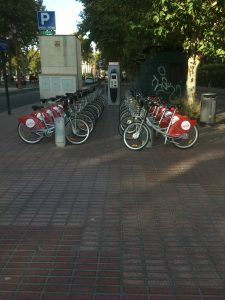 I hope to continue exploring Sevilla and discovering new sights!